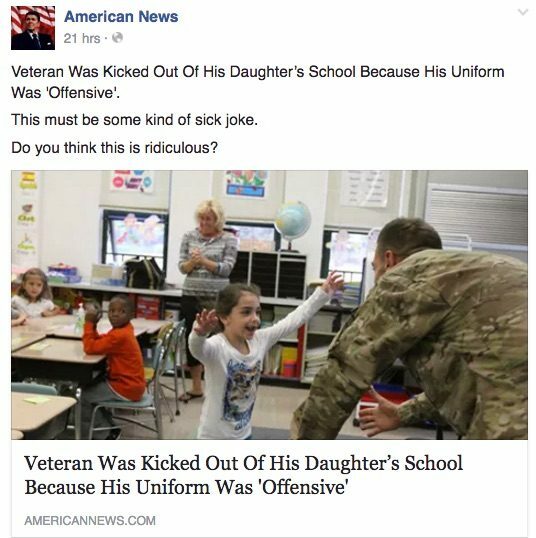 A misleading social media page claimed a uniformed veteran was kicked out of his daughter's school because his attire was offensive. A military veteran picking his child up from school was ejected lest other students find his uniform offensive. In 2014, a veteran in uniform was asked to wear plain clothes to school so as not to alarm special education students. The veteran wasn't rudely ejected from the school, nor did anyone claim his uniform was offensive. Recently, it came to light that a high school in Michigan was taking things to an extreme. When Lieutenant Colonel Sherwood Baker, a 24-year-old military veteran was taking his daughter to school in uniform, he was stopped by one of the school’s security personnel. An Army lieutenant colonel was prevented from entering his daughter’s Detroit-area high school by a security guard who said those in military uniform weren’t permitted inside. The incident, which occurred Tuesday at Rochester Adams High School when Lt. Col. Sherwood Baker visited the school to help his daughter transfer to a different math class, triggered online outrage and a rapid response from the school district’s superintendent, a former Marine officer. Shafer said he received word on the incident from the high school about the same time the story hit the airwaves. The item wasn’t the first outdated or misleading story shared by American News. Prior false or misleading items shared by that web site included claims that Texans were being forced to pay slavery reparations, Canada banned Beyonce after her Super Bowl 2016 performance, President Obama prohibited a Navy Admiral from distributing Bibles to fellow servicemen, FEMA opened a concentration camp in Arizona, and President Obama declared Islam the official religion of America. This particular claim was a variation on “shunned servicemen” urban legends, which frequently involve exaggerated or fabricated claims of unkindnesses directed at soldiers and veterans due to purported anti-military sentiment in the United States. Army Times. 12 September 2014.